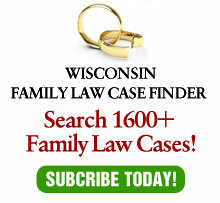 On April 26, 2006, the Wisconsin Court of Appeals ordered the decision in Frisch v. Heinrichs, 2006 WI App 64 published, despite written pleas from the American Academy of Matrimonial Lawyers, the Wisconsin Department of Workforce Development and the Wisconsin Family Court Commissioners Association to the contrary. Depending on how strictly the holding is read, the result may cause severe problems in allowing courts to order a person who disobeys a court order to make the innocent party whole. The Court of Appeals decision reversed and remanded a post-judgment contempt judgment order with sanctions rendered by the Waukesha County Circuit Judge Ralph M. Ramirez, stemming from the husband’s failure to timely provide copies of his income tax returns to the wife. The case had a tortured factual and procedural history — one good reason right there why it should not be published. Cutting through a great deal of detail, the eventual holding was that a circuit court cannot use its remedial contempt powers to sanction a child support payor who fraudulently fails to timely provide copies of his tax returns, which, when produced, revealed greater income that previously represented. Lost in the morass of the peculiar facts of the case is an important issue: What remedy is available when a support payor receives a substantial increase in income, but does not report it, contrary to Wis. Stats. §767.263? In Frisch, the parties had reached an unusual stipulation to essentially freeze child support for a four-year period, thus mooting the effect of the reporting requirement. This question, then, will have to wait for another day. To the extent that this holding is limited to the facts in this case (particularly, where there is a stipulation freezing child support – a very unusual occurrence), the decision is benign and the court’s ignoring the pleas to not publish will be meaningless. On the other hand, if trial courts read the decision strictly, it could be used to argue that once the underlying act has been corrected, a court is deprived of remedial power. Such a strict holding would cause great concern as it would allow manipulative parties to cause costs to the other side which could not be remedied by the trial court. Once again, this case demonstrates the problems of publication decisions by the Court of Appeals. As noted in this column previously, the entire rule prohibiting citations to the court’s own decisions is a bad one. However, if the court is going to have such a rule, it would be nice if they would solicit and pay attention to the opinions of those in the trenches. Here, the court chose not to, perhaps at great risk to innocent parties.